This patient in her mid-forties has weakening of her abdominal muscles as well as protuberant and loose skin and fat especially below her belly button. Views show a flat tummy and a nicely shaped body contour with a newly fashioned belly button. The stretch marks that were above the belly button are now below while all the stretch marks that were below the belly button have now disappeared. 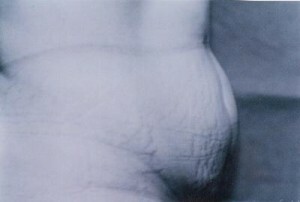 Her scars are short and are not visible on the lateral view despite the fact that this is a classical tummy tuck. Post-op photos were taken at 2 months.